Ultherapy Toronto – Is It Worth The Pain? Ultherapy is the only FDA-cleared non-surgical, non-invasive procedure that tightens the face, neck, chin, and lifts the brow as well as improves lines and wrinkles on the chest. Ultherapy works by delivering ultrasound energy to the muscles beneath the skin, which allows lifting, and a tightening effect. Ultherapy also stimulates energy that directs your skin to produce collagen. Although Ultherapy can provide exceptional results, some men and woman are hesitant from having Ultherapy performed, because of the belief that it involves pain. When Ulthera was first introduced to the market, the treatment protocol was based on high energy levels. The treatment protocols were more intense and most likely contributed to this reputation of causing discomfort and pain. The energy delivery and treatment protocols have since been modified by altering some of the treatment parameters. The new protocol is known as the Amplify Treatment which is now able to be performed with minimal discomfort. Although most patients are able to tolerate the Ultherapy procedure without significant pain; they can certainly feel the procedure. There are certain areas of the face, such as the forehead and jaw line that tend to be more sensitive area’s to treat. These noted areas are usually where the bone lies closer to the skin. Although everyone’s pain tolerance and comfort level vary, there is an advantage, and that is that the sensation only lasts while the energy is being delivered. Another factor to consider is that the pain factor is also dependent on the depth of penetration (deeper transducers seem to elicit more discomfort. Oral pain medication is recommended such as Ibuprofen, Tylenol or Advil, and can be taken 1 hour prior to the procedure. Most patients have found that oral medication has lessened the pain, and makes the treatment completely tolerable. 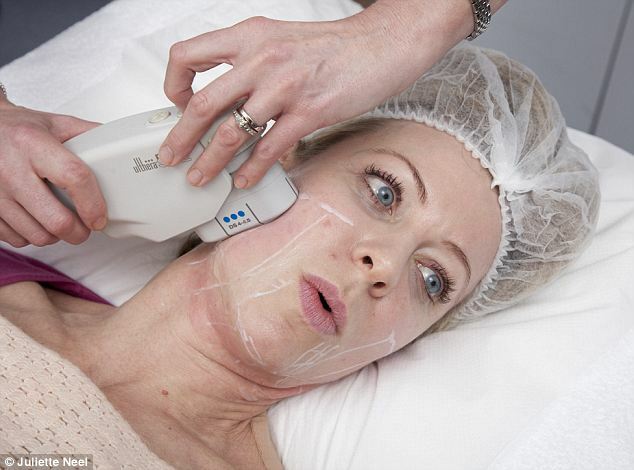 There is no downtime associated with Ultherapy, however it is not uncommon for patients to experience a bruised feeling afterwards, yet there is usually no visible effect on the skin, as the targeted area goes deeper. Patients can go back to their regular routine as soon as they leave the clinic. Some patients may experience slight swelling, tingling or tenderness to the touch, but these are mild and temporary. It may hurt some, but it works! No Pain, No Gain!